Spring Surf Sessions are here! 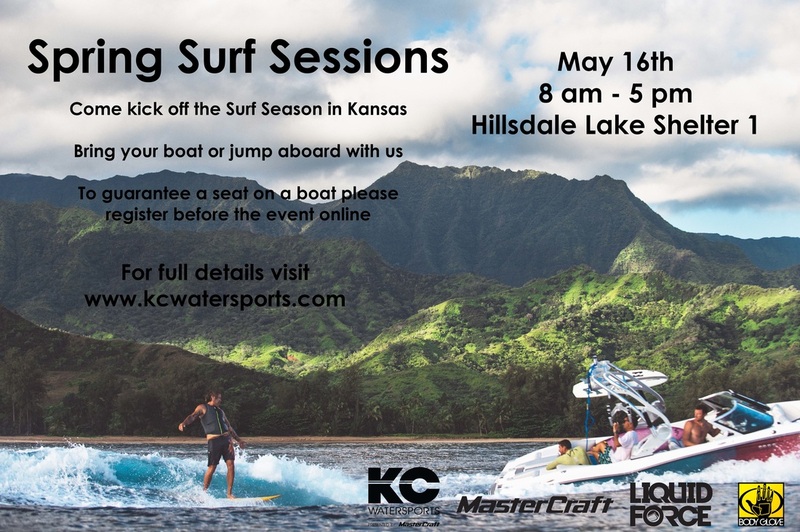 Come join us in kicking off the surfing season in Kansas with a Spring Surf Session. Last year at or Synthetic Swell event we had 9 boats show up and have over 60 riders! We taught about 20 people how to wakesurf and enjoyed seeing everyone ride. This year we already have 6 boats confirmed and know that there will be some amazing waves out on the lake. Here are all of the details for this years event. This is NOT a competition - more like demo day + festival + shred clinic. Bring your wetsuit if you have one, if you don't, we have several to loan. Bring extra wetsuits if you have any. We expect the water to be in the mid 60's so some of you will probably not even need a wetsuit. How much: All of our boats & boat drivers are there pro bono. While we are not requiring a sign up fee we do ask that you please take care of your boat driver with some gas money. $10-$20 is suggested. There is a grill in the shelter that we will have fired up. KC Watersports will be supplying hot dogs & hamburgers. Please bring something for everyone to share. Enjoy a day of wakesurfing and boating with others that share your passion for shredding a big wave behind the boat. The event will take place on Saturday, May 16 at shelter 1 on Hillsdale Lake. Organizers expect at least 5-6 boats participating and will accommodate up to 100 surfers throughout the day. You and your crew can bring your boat and/or try out the wakesurfing experience behind other boat models. If you don’t have a boat, no problem! There will be plenty of sessions available for everyone. You don’t even need a board if you don’t have one because those will be provided as well. The idea is to share boats and boards so that everybody can try out whatever setup they’re interested in. Come hangout with and meet the guys from SurfinKC! This is a great way to meet up with some other like minded people! Register Now to guarantee a spot!